With this in mind, she signed up for teacher training in India. Upon arriving, however, she discovered she knew nothing about yoga. “Yoga” encompassed much more than the physical postures. Never before did she consider the other aspects of yoga — like the eight limbs or Patanjali’s teachings on the subject. But she dove deep into her practice and after an intensive month in India, her yoga practice turned into her life’s path. She went from “doing” yoga, to truly practicing it. In fact, yoga was her saving grace after the military as she battled with PTSD, depression, and anxiety. The more she practiced yoga, the more she learned how to grow from her trauma; she began to listen to herself and heal. Her 200-hour Yoga Teacher Training program led her to many trauma-sensitive yoga trainings, including Warriors at Ease and iRest. Rachel completed all levels of Warriors at Ease training, becoming one of our first fully certified teachers. She’s also attended Warriors at Ease Veteran-Civilian retreats and is an active participant in the Warriors at Ease community in Colorado where she now lives. 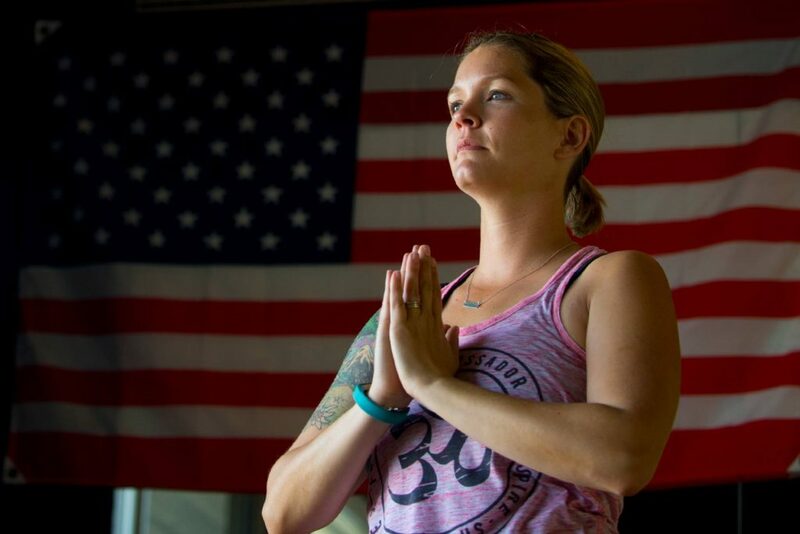 We’re honored and grateful to have veteran yoga teachers like Rachel in our Warriors at Ease network. She’s a bright light that’s sharing these powerful practices from a place of love, deep passion and personal experience. Image courtesy of Shri Studios.